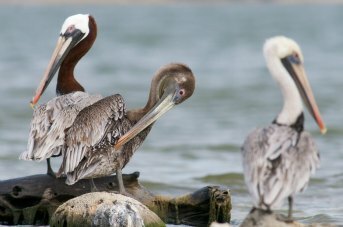 The Brown Pelican is unmistakable because of the large skin pouch under its long grey bill. This pouch can hold two to three times as much food as the pelican’s stomach, and serves as a net to catch fish. The Brown Pelican, together with the Peruvian Pelican (previously thought to be a subspecies of the brown pelican), is the only member of the pelican family that catches its prey by plunge diving, with its long broad wings partly folded. Because this bird has very good eyesight, it can spot fish from a height of 20 m (~65.6 ft)!! They cab be spotted along the coast line and in the mangroves of Lac Bay.